Caledonia Pride’s 13th game of the year was another unlucky one as the Edinburgh pro side missed out on the Women’s British Basketball League play-offs after slumping to its heaviest home defeat of the season. Pride beat mid-table Durham Palatinates last October, but eight straight losses and a season-ending injury to star player Tia Weledji had sapped their morale and Durham were easy winners at Oriam. The home team trailed by 18 points at the end of the first quarter and by 32 at half time as the gap continued to grow. An even final period restored some self-respect, but the 94-54 defeat was still their second-biggest in all competitions this season. Amidst the gloom, 15-year-old Ella Doherty offered hope for the future by top-scoring with 14 points, while Sian Phillips also made it into double figures. 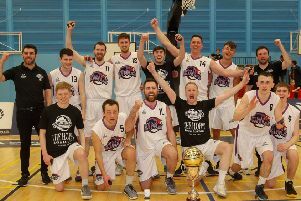 Having now missed out on a play-off spot, Pride will return to Oriam this Saturday for their final home game of the season, and the task for coach Bart Sengers’ battle-scarred troops could hardly be more daunting. Reigning WBBL champions Sevenoaks Suns top the table again after winning all 20 league games this season and they trounced Pride 89-42 when they last met in December.